4 Which Cushion to Use? 8.1 How do you decide which fabric to use for the cushion cover? 8.2 Does foam contoured pressure relief cushion work for all users? 8.3 Is the foam contoured pressure relief cushion hot or does it cause sweating? 8.4 Do all wheelchair users need a pressure relief cushion? 8.5 What happens if the cushion is used back-to-front or upside down? 8.6 Does this cushion work for children? Provide Postural Support and Compensate for Deformations (Individuals with Cerebral Motor Impairment). Balance Pressure and Maintain Posture (Individuals with Spinal Cord Impairment e.g. Spina Bifida, Spinal Cord Injury). Improve Comfort and Posture (Individuals with Multiple Impairments and the Older Person). Transport (weight, size, portability, etc.). how they are made e.g. foam cushions may be “moulded” from one piece of foam or “layered” made from a number of layers of foam). The most commonly available cushion is a foam cushion. Foam cushions are also usually the least expensive. They are easy to make where foam is available and easy to modify to suit individual wheelchair users. Reducing shear by assisting the wheelchair user to sit upright. The base of a pressure relief cushion should provide a Firm Stable Base. This will ensure the cushion provides good support for the user and does not move when the user moves. Over the base layer there should be a “comfort layer”. This is a layer (or more than one layer) of softer foam. 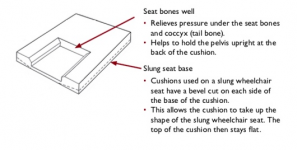 The top layer should be soft enough to allow the seat bones to sink into it, but should not be so soft that the seat bones can sink all the way to the bottom and rest on the solid base or seat of the wheelchair. Grooves or gutters for the legs. The Gel / Fluid pack automatically matches the shape of the wheelchair user’s body. This helps to distribute the user’s weight evenly and reduces pressure under bony areas. Can be made locally (where there is high-quality foam). Can be modified locally to accommodate different needs. Not subject to”sudden collapse” e.g. a puncture in the air/fluid/gel cushions can cause the release of the materials from the cushion and stop the cushion from relieving pressure, causing “sudden collapse” of the cushion. The top layer of a layered foam cushion can be replaced easily and at a low cost, rather than replacing the whole cushion. Foam compresses, becoming flatter and firmer over time. For this reason, foam cushions should be checked regularly and replaced every 1 - 2 years. Can take a while to dry out, a problem for people who are incontinent. Foam insulates and can cause an increase in tissue temperature. Pressure is distributed evenly over the seat surface. The gel pad automatically adapts to the body when the wheelchair user moves or changes position. Air/fluid/gel cushions are often more expensive and less readily available than foam cushions. Some wheelchair users find air / fluid / gel filled cushions make them feel unstable. Subject to “sudden collapse”. In any context where a wheelchair user is not able to get a replacement cushion quickly, this can be a problem. A pressure relief cushion should have a cover which can be removed for washing and is water-resistant. The material used for a pressure relief cushion cover should be either stretchy or loose enough to allow the seat bones to sink into the foam. if the cover fabric is not stretchy, a thin fabric is best. Folds in a thin fabric will be less likely to mark the skin and cause a pressure sore. if thin plastic is used under a fabric cover, this also needs to be loose enough to allow the seat bones to sink into the foam. Always advise wheelchair users that if their cushion or cushion cover becomes wet it needs to be dried and replaced only when dry. For wheelchair users who are incontinent and at risk of developing a pressure sore, provide two cushions which may be used in turn. Wherever possible, wheelchair users who are incontinent need a cushion cover which is water-resistant and will keep fluid away from the user’s skin. protect the cushion with a very thin plastic bag inside the cover. the wheelchair user should ensure that the cover is dried out if it becomes wet and the plastic bag cleaned or replaced. 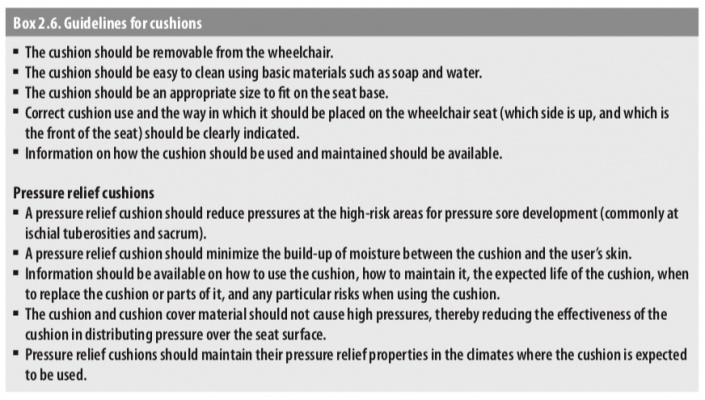 Whenever you prescribe a pressure relief cushion, carry out this simple manual test to check whether the cushion is reducing pressure under the user’s seat bones. The test requires personnel to place their hands underneath the wheelchair user’s seat bones. Always explain to the wheelchair user what you are going to do and why it is important. Always carry out the test with the same cushion and the wheelchair that has been provided for the user. If Level 2 (Warning) or Level 3 (Unsafe) pressures are found under the sitting bones (Ischial Tuberosities), action is needed to reduce the pressure. A simple solution is to add an extra layer of firm foam. This is called a ”lift”. The lift should be approximately 20 mm thick and have holes cut out under the seat bone area. The lift is placed underneath the cushion and inside the cover. Sometimes more than one layer is needed. Personnel should add one layer and test the pressure. If the pressure is still level 2 or 3, add another layer. If foam is available, wheelchair service personnel can make a foam pressure relief cushion with just a few tools. Personnel need to know what foam to use, and a few important dimensions. The instructions below show how to make a basic foam pressure relief cushion, with two key contours. These are a “well” under the seat bones and a shelf in front of the seat bones. The following instructions provide a cushion of dimensions 400 mm wide x 400 mm deep x 50 mm high. The Ischial Tuberosity Well is 200 mm wide x 200 mm deep x 35 mm high. This cushion would be suitable for a wheelchair user with a seat width of 400 mm. Adapt the dimensions to suit the size of each wheelchair user as described in the box below. Draw the cut lines with a dark coloured marker on all six sides of the base foam. Seat Bones Well Height = 35 mm for adults and 20–25 mm for children [c]. Use a sharpened hacksaw blade or long knife. Use long slow strokes, cutting mostly when pulling to improve control. Both the base and top layer are placed in the cushion cover together. The two layers do not need to be glued together. If the top layer becomes soiled or worn, it can be washed and dried, or replaced. A lift can be added within the cover to increase the depth of the seat bones well. the seat bones are sitting inside the seat bone well and not on the edge or top layer. How do you decide which fabric to use for the cushion cover? Choose a fabric which is stretchy if possible. Water-resistant fabric is very good if available. if the fabric is water-resistant make sure it is not too thick, or the folds may cause marking on the wheelchair user’s skin, which can lead to a pressure sore. The choice will depend on the fabric available. sometimes the choice is limited. If there is a choice and you are not sure, ask wheelchair users to trial different options. Wheelchair service personnel will develop experience as different fabrics are tried. Does foam contoured pressure relief cushion work for all users? No, foam contoured pressure relief cushion will not work for all wheelchair users. However, one advantage of this cushion is that it can be easily adapted. Is the foam contoured pressure relief cushion hot or does it cause sweating? Foam cushions can be hot and can cause sweating. However, the cushion performs well in many other ways, so putting up with the heat is a compromise in some cases. Do all wheelchair users need a pressure relief cushion? No - not all wheelchair users need a pressure relief cushion. 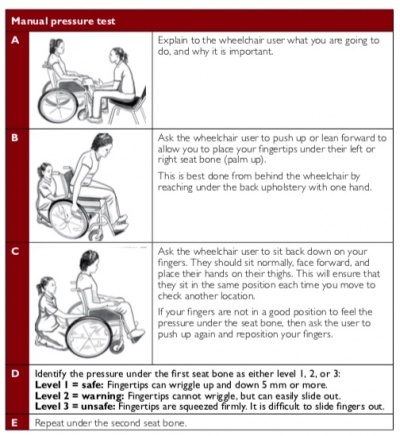 Consider the pressure risk factors to decide whether a wheelchair user is at risk of developing a pressure sore. Although the foam contoured pressure relief cushion may not be needed for pressure relief, the cushion can also improve comfort and posture, even for wheelchair users who are not at risk of developing pressure sores. What happens if the cushion is used back-to-front or upside down? It will not work properly and may even increase the risk of developing pressure sores. Always make sure that wheelchair users, and family members (where relevant), understand how to use and care for the cushion correctly. Mark the cushion “Front” and “Back” or “Up” and “Down” if necessary. Does this cushion work for children? Yes, this cushion would work for children. However, the seat bone well needs to be smaller. ↑ 1.0 1.1 1.2 William Armstrong, Johan Borg, Marc Krizack, Alida Lindsley, Kylie Mines, Jon Pearlman, Kim Reisinger, Sarah Sheldon. Guidelines on the Provision of Manual Wheelchairs in Less Resourced Settings. World Health Organization; Geneva: 2008. ↑ Agence d’évaluation des technologies et des modes d’intervention en santé (AETMIS). Postural-support devices. Report prepared by François Pierre Dussault. (AETMIS 03-07). Montréal: AETMIS, 2005, x-47 p.